Background: Handheld echocardiography (HHE) has been increasingly used for rheumatic heart disease screening and in adult emergency room settings. Aims: This study aimed to validate the accuracy of HHE in the diagnosis of congenital heart disease (CHD). Settings and Design Methodology: This is a prospective study carried out at three pediatric cardiology outpatient clinics in Khartoum, Sudan. All patients with suspected CHD were evaluated by clinical examination followed by HHE, performed using a modified segmental approach. Then, a complete study was performed using a standard echocardiography machine. The results were then compared using appropriate statistical tools. 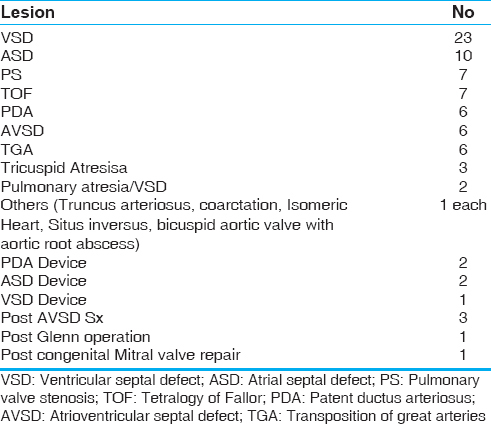 Results: A total of eighty cases were included with the following diagnoses either in isolation or combination: ventricular septal defect (n = 23), atrial septal defect (n = 10), pulmonary stenosis (n = 7), tetralogy of Fallot (n = 7), patent ductus arteriosus (n = 6), atrioventricular septal defect (n = 6), transposition of the great arteries (n = 6), and other diagnoses (n = 15). Agreement between HHE and SE was excellent both for visualizing heart segments (κ =77%–100% with a mean of 92.9%) and for diagnosis of CHD (κ =66%–100% with a mean of 91.7%). The sensitivity of HHE was 69.2%–100% (mean = 90.2%) and specificity was 98.5%–100% (mean = 99.3%). Conclusion: This study supports extending the utility of HHE in children for screening of CHD in addition to its current role in rheumatic heart disease screening. Subsequently, many studies have reported HHE to be a reliable tool for screening of rheumatic heart disease (RHD) with good comparability to SE.,, However, the use of HHE for diagnosis of congenital heart disease (CHD) has not been adequately investigated. Such utility may have an important role in remote areas as well as for sick children with suspected CHD where urgent decisions need to be made. We conducted this study to evaluate the reliability of HHE in the diagnosis of CHD. The study was conducted in three pediatric cardiology outpatient clinics between June and August 2017. All patients with suspected CHD were included; those who were found to have rheumatic or other forms of heart disease were excluded from the study. Patients were evaluated by clinical history and examination; an HHE study was then performed using GE–Vscan (General Electric, USA), which is a palm-held machine with a weight of 13.8 oz and a 3.8 mHz phased array transducer. It has facilities for 2D imaging and color Doppler as well as digital storage, but no pulse or continuous wave Doppler. A modified segmental approach was used that included all the standard views, except that pulse and continuous wave Doppler were not done. Then, a complete SE study was performed (Esoate-My Lab 50, Italy) for each patient using the standard segmental approach. Findings of the two machines were recorded on a data sheet. Both echo studies (HHE and SE) were performed by a pediatric cardiology consultant or senior fellow who were blinded to the patients' final diagnosis. Approval of the Ethics Committee of the Faculty of Medicine, University of Khartoum, was obtained. All patients' guardians were asked to sign informed consent before conducting the study. Data were entered into SPSS program (version 2015, IBM, USA), and the agreement between the two machines regarding the description of each heart segment as well as the final diagnoses was calculated using Cohen's Kappa test (κ). In addition, the sensitivity and specificity of HHE for the diagnosis of CHD were calculated. Eighty cases were included, of which 71 had CHD and 9 had a normal heart. The age ranged between 3 days and 14 years with a mean age of 4 years. CHDs seen included simple and complex defects as well as patients who had undergone surgery or catheter intervention as shown in [Table 1]. The agreement between HHE and SE was calculated for the ability to visualize heart segments. Kappa value was found to be 77%–100% with a mean of 92.9% [Table 2]. 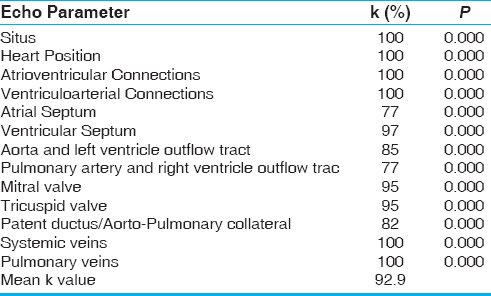 Kappa was also calculated for the agreement between the two machines for the diagnosis of 13 types of CHD as well as for normal echo and was found to be 66%–100% with a mean of 91.7%. 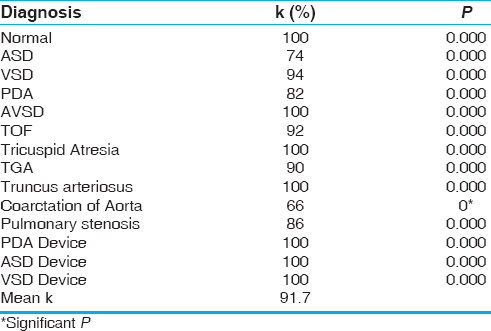 One case of coarctation of aorta was missed by HHE (κ = 66%) [Table 3]. The sensitivity and specificity of HHE were calculated for seven diagnoses. The sensitivity of HHE was found to be 69.2%–100% with a mean of 90.2% and specificity was 98.5%–100% with a mean of 99.3% [Table 4]. The image quality of HHE was comparable with that of SE as shown in [Figure 1], [Figure 2], [Figure 3], [Figure 4], [Figure 5]. The right-sided panel in each figure shows the still frame of SE and the left-sided panel shows the image for the same patient by HHE. It is desirable to have a light echo machine that can be used to screen for CHD, particularly in acute care settings. Moreover, in resource-limited countries, high-end echo machines are only available in a few referral hospitals, leading to long waiting times that can adversely affect patients' outcomes. HHE machines have proven to be reliable in screening for RHD, with a sensitivity approaching 98% in diagnosing definite disease even when using a single view. On the other hand, imaging CHD needs a more detailed examination of the heart segments using segmental/sequential analysis and understanding of hemodynamic effects at different ages. To conduct CHD echo, operators need considerable duration of training and comprehensive understanding of the pathophysiology of the lesion. In this study, HHE proved to have substantial agreement with SE in the examination of all heart segments. Similarly, acceptable agreement was found when we analyzed the diagnoses made by the two machines. Although the lack of pulse and continuous wave Doppler may lead to limitations in HHE examination, common lesions such as pulmonary stenosis could still be identified by looking at 2D echo and color flow mapping. Similar to our findings, Lo et al. reported an excellent agreement between HHE and SE in a cohort that included children and adults with CHD. In another report, Riley et al. investigated the ability of HHE to inform the decision-making in the pediatric cardiology outpatient clinic. They found that HHE had a sensitivity of 75% and a positive predictive value of 100% with a substantial agreement between SE and HHE imaging (κ = 82%). In the latter study, the experience of the cardiologist performing echo had an important impact on the accuracy of HHE. These findings support the use of HHE to screen for CHD, provided that operators are fully trained in the segmental approach. In addition to the outpatient setting, HHE machines could find use in nurseries, pediatric Intensive Care Units, and emergency rooms as a screening tool for urgent decision-making. Moreover, HHE could have a role in neonatal screening for CHD. There have been extensive studies into the use of clinical examination and pulse oximetry for CHD screening in neonates in the recent years. Clinical examination in isolation was shown to miss many cases of critical CHD. When clinical examination was combined with pulse oximetry, the sensitivity to detect duct-dependent pulmonary circulation was found to be 100% although the overall sensitivity remained at only 82%. Although the false-positive rates with pulse oximetry were less than that of physical examination alone, they were significant leading to unnecessary referrals for echocardiography. Therefore, when performed by trained cardiologists, HHE could have a role as a more sensitive and specific tool for neonatal screening. Further studies are needed to evaluate this utility and to develop appropriate protocols recognizing the limitations of early echo examination of neonates, which include the presence of physiological/transitional shunts such as ductus arteriosus and patent foramen ovale that may need a second follow-up by echo. We documented that HHE has an excellent agreement with SE both for visualization of cardiac segments and for diagnosis of CHD. We believe that it will have an important role in screening for CHD in emergency settings and neonatal units. Kimura BJ, Demaria AN. Empowering physical examination: The “laying on” of ultrasound. 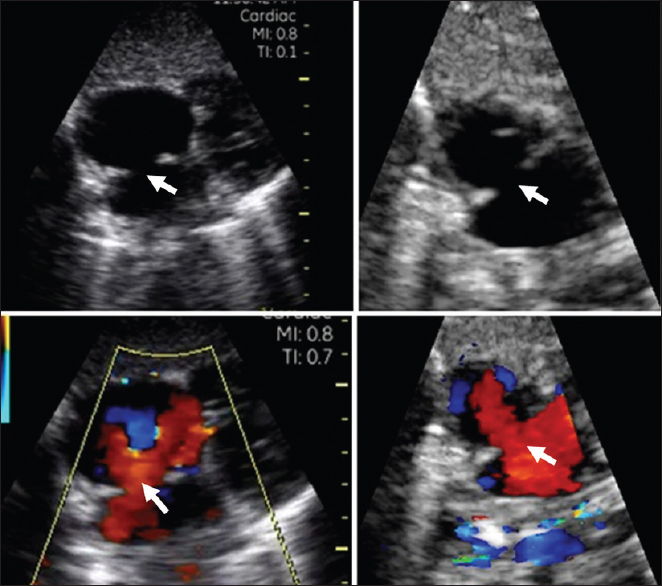 JACC Cardiovasc Imaging 2008;1:602-4. Cardim N, Fernandez Golfin C, Ferreira D, Aubele A, Toste J, Cobos MA, et al. Usefulness of a new miniaturized echocardiographic system in outpatient cardiology consultations as an extension of physical examination. J Am Soc Echocardiogr 2011;24:117-24. Ali S, Domi SB, Elfaki AM, Al Talib K, Abdelrahman MH, Adam MS, et al. The echocardiographic prevalence of rheumatic heart disease in North Kordofan and initiation of a control program. Sudan Med J 2017;53:63-8. Godown J, Lu JC, Beaton A, Sable C, Mirembe G, Sanya R, et al. Handheld echocardiography versus auscultation for detection of rheumatic heart disease. Pediatrics 2015;135:e939-44. Beaton A, Lu JC, Aliku T, Dean P, Gaur L, Weinberg J, et al. The utility of handheld echocardiography for early rheumatic heart disease diagnosis: A field study. Eur Heart J Cardiovasc Imaging 2015;16:475-82. Lu JC, Sable C, Ensing GJ, Webb C, Scheel J, Aliku T, et al. Simplified rheumatic heart disease screening criteria for handheld echocardiography. J Am Soc Echocardiogr 2015;28:463-9. Lo MH, Huang CF, Lin IC, Lin YJ, Kuo HC, Hsieh KS, et al. Clinical utility and diagnostic accuracy of palm-held, mini-sized ultrasonocardiographic scanner in congenital heart disease. J Formos Med Assoc 2018;117:141-6. Riley A, Sable C, Prasad A, Spurney C, Harahsheh A, Clauss S, et al. Utility of hand-held echocardiography in outpatient pediatric cardiology management. Pediatr Cardiol 2014;35:1379-86. Meberg A, Otterstad JE, Frøland G, Hals J, Sörland SJ. Early clinical screening of neonates for congenital heart defects: The cases we miss. Cardiol Young 1999;9:169-74.
de-Wahl Granelli A, Wennergren M, Sandberg K, Mellander M, Bejlum C, Inganäs L, et al. Impact of pulse oximetry screening on the detection of duct dependent congenital heart disease: A Swedish prospective screening study in 39,821 newborns. BMJ 2009;338:a3037.